Fiction – paperback; Penguin Australia; 676 pages; 2000. 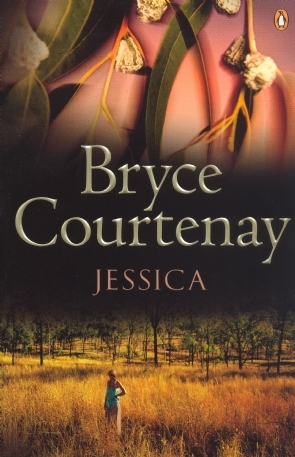 Bryce Courtenay’s Jessica is a best-selling novel set in outback Australia during the early 20th Century. Jessica Bergman, the heroine of the book, is a tomboy who helps her father, a Danish immigrant, run the family farm. Meanwhile her elder sister, the beautiful but stuck-up Meg, dreams up plans, with the help of her mother, to wed the local rich boy. When a brutal murder is carried out at a neighbouring farm, Jessica helps the killer survive a lynch mob hell bent on delivering their own form of justice. This one act of compassion has long-term implications for the rest of Jessica’s life – and she is banished from her family, from society and, later, from her child, who is born out of wedlock. While it’s supposedly based on a true story, Courtenay offers no explanations, no historical footnotes or afterword to back this up. I’m inclined to think that the murder and Jessica’s role in its aftermath may, in fact, be the only true elements and Courtenay has fabricated the rest, which is fine, because it’s fiction after all, but as a reader I would have liked to have known what was true and what was not. That’s not my only problem with Jessica. I found much of it sloppily written and in need of some strong editing. It’s at least 300 pages too long. The story meanders all over the place and goes off in unexpected tangents. I would not mind this if those tangents were neatly drawn together at the end, but they are not. Instead, it’s like the author made things up as he went along – and no one, not even the editor he so generously thanks in his acknowledgements, bothers to pull him up on this. The author also has a tendency to hector his readers with his own views (on the treatment of women, on the treatment of aboriginals) instead of letting the reader make up their own mind. I found this patronising and it irritated the hell out of me. Some of the scenes are overworked and repetitive, much of the dialogue is false (including the colloquialisms, which grated) and the characterisation poor and based on stereotypes (the mother, for instance, is like the Wicked Witch of the West and Jessica may as well have been Cindarella). All of this is a shame, because there’s a brilliant novel in here just dying to get out. A second, possibly third, draft might have ironed out some of these problems. All in all, Jessica has confirmed what I have thought all along: that this best-selling author is really not for me. Although, judging by his sales figures, I’m probably quite alone in this view. And if you look at the favourable reviews on Amazon.co.uk I suspect I’ll be lynched for giving this book just two stars. Oh well. It’s an interesting phenomenen of modern publishing that only moderately successful authors get decent editing. Publishers won’t spend money on new writers that may not sell and recoup their costs and they let ultra successful writers get away with murder – ego triumphs over editing, or maybe it’s that they won’t spend money on what will sell anyway. I know publishing is a tough business, but as a reader I’m tired of being sold short. i think this is a great story i liked it and it was also formed around where i lived but i thought it was great i dont like reading but i read the whole book and found it really interesting!!! I’ve only read half this book so far..it’s great – easy to see why its a bestseller. I read this book in one piece aboard the train and it was just so captivating, emotional and touching. Especially in the end I couln’t help myself crying so everybody around me was just staring at me like I was a lunatic. So for me it’s also quite obvious that it’s a bestseller. I just read the book JESSICA from Bryce courtnay i thought the book was fantastic very moving and i couldnt put it down i loved it so much i hope the author writes more books like this again. I thought Jessica was a fantastic book. I have never cried so much when reading a book. I could not put it down. I have just read jessica and the persimmon tree.I could not put either them down.I cried at the end of jessica. Great writer .Not much house work done. I think that the novel of Jessica’s life is extremely well written and touching. I also think that the first commentator must keep to classical literary work and stay away from obviously brilliant novels…actually I think that he/she must be an unhappy person to take such pleasure in breaking down the work of someone else’s hand, which I am sure he/she could not do better! Please disregard the first review on this page, it is a great read. I couldn’t stop thinking about the book when I wasn’t reading it, and wasn’t satisfied until I had finished it. I agree with the 2 stars. I have only just finished reading the book. I must admit I was sucked in by the sentiments and cried at the end. BUT who was the original Jessica? This is who I was looking for when I stumbled on your site. I think I’ll stick with fiction as opposed to being frustrated with faction. Glynis, thanks for your comment. I was beginning to think I was the only person in the world who thought this book was rubbish. I was really satisfied with your review (unlike the book). I was certainly sucked into this novel because the story really is quite interesting. Unfortunately Courtenay did a poor, drawn out, laborious effort at telling it. I literally skipped pages of the court proceedings because they were so frivolous and ultimately missed nothing! Also what about Jessica’s child? Courtenay writes more than neccessary yet leaves so many questions unanswered. Maybe the TV mini series is better? i just finished reading this book and was in tears. it was THE best book that i have evr read and will ever read. it was so moving . i could related it my best friends life it was just . oh my god. i am only 13 so people dont realy take me seriousl but this book was just wow !! Quite frankly i disagree with your “smack” talk about this book. If your looking for “explanations” and “historical footnotes” how about you look them up yourself. This book is clearly not written for just these things it is to inspire and it has a purpose to reach into the hearts and minds of people. personally i think you need to get a grip because I read this book when i was 15years old and I know that even now at 18 years old i would read it all over again. if(how bout you edit that for me..) you wish to talk so badly of it then why did you keep reading it until you finished the book if you disliked it that much. Have respect for the author and if your so “perfect” then why don’t you write a story yourself! I bet it’d be hard to be so accomplished such as Bryce Courtenay. Save your negativity for yourself noone wants to hear it. If your lifes so bad that you got to be a downer about a marvellous book then I think you have some serious issues and need to consider therapy. although your so negative and judgemental you’d probably think the therapist needs the therapy. you’d probably even analyse how they do the job. I pity you negative attitude. How about you take you sadistic reviews someplace else!!!!! I LOVE THIS BOOK! it’s the one of the best. mr courtenay is a genious. hi bryce your books are a god send i’m really keen to read four fires, the power of one, whitethorn, april fool’s day, tandia and many more. keep writing! rachael,14, aspiring writer inspired by rachael treasure, helen dunmore, lizzie wilcock, j.k rowling and of course bryce courtenay. While I agree that this book is probably a bit too long, I think it’s still a well written story, very tragic and heartbreaking – just my little opinion – although if we all had the same opinions we’d live in a boring world! I also agree that it would have been nice to know more about the factual story, at least in footnotes or an afterword. His first book I read was April Fools day, which I’ve put on my list of top reads of all time, and then I read The Power of One, which I thoroughly enjoyed. Since I’ve read The Power of One I’ve never really felt inclined to read him again, but Jessica looked interesting and although I don’t believe it’s as good a story as The Power of One, I am still impressed by Jessica. I am glad to have finished this book because i was not getting much else done and not able to sleep either. It was fantastic, very emotional and an unexpected end. The author having claimed it is based on a true stroy did it for me because i usually prefer true stories, though it would have been nice to know which part was the true part. it was my first book by Bryce courtenay and i shall definitely read more from him. i read this book on my school holidays and cried all day. i just loved it. Although I respect the opinions and views of the person who has made the original overview and comment of Bryce Courtaney’s ‘Jessica’ above, I do believe that he/she is missing the overall point of its dramatic meaning and element. Books are made to set human beings into another universe, and to ultimately effect one with the story and its characters. Not only did I thoroughly enjoy Jessica, I felt in the pit of my stomoch her absolute pain that was inflicted upon her at what started at such a young age. The book portrayed utmost honesty within its historical background and was a very real interpretation of the era and age of what Australia was experiencing. This was portrayed acceptionally within the stereotypes made against women, aboriginals and monetry status within society at the time. I believe that this book completely took me out of my comfort zone, comfronted me and made me step back and see myself in the shoes of this incredible woman, Jessica. If the person up the top is unable to do this, then they’re literature will not succeed as this is the ultimate goal for a writer to accomplish; making they’re readers feel something. The book JESSICA truly encaptivated my heart as i read about her troubles and how all she ever wanted to do was fit in with society and be considered an equal. The routine her life is based on and how the cracks of her life just never seemed to set right truly kept me hooked and i have never felt that depressed listening to the base story of someone elses life. Even at a young age ‘Jessica’ was put to back wrenching work, and looked upon when she did something others did not approve of. The era in which the story is based has been well researched and on the pages it reflected a true understanding of the harsh Australian outback. Thankyou Bryce Courtenay, your a true inspiration to upcoming writers and earger readers like me!! This book was amazing. one of the best books i have ever read. although i will have to agree that it dragged on a bit in some parts and is way longer than it should be. but overall i thought the actual story was beautiful, yet so tragic. That poor girl. The first of Bryce Courtenay’s books that I have read. I was so affected by this book that I found myself coming back from my lunch break in a foul mood, just because of the way Jessica was being treated. I agree that it did go on a little too long in parts but that’s probably what makes it so much more real. I have done a fair bit of hunting to find the story that it was based on but so far no luck. It would have been great if Bryce had written a page at the end maybe explaining what incidents in the story were based on fact and maybe some names or dates so that we might do our own research though. While I loved the whole storyline Courtenay brought out with the romeo-juliet esque forbidden love, the structure of the story was quite random sometimes…as were the last 100 pages of the book where it started talking about the stolen generation and about what mary and her children and grandchildren instead of actually sticking to the plot of Jessica and her family. I thought the book was amazing up to when she goes to the mental instituition. After that, i reckon the book should go to a mental institution and should be straightened out a little. What a pity, this could have been one of those unforgettable and untarnished novels if it were not for the slightly offtrack things which happened from the 2nd half of the novel. I received the book Jessica in a mutual tradeoff of books with a group of friends. I picked it up one rainy evening and started to read, and I didn’t put it down till four in the morning. Jessica simply wove her magic and drew me into her life. Yes, the book does wander a bit, but the true spirit of Jess just keeps you coming back for more. I don’t ever remember crying so hard at the end of book in all my 63 years. I’ve re-read the last few chapters at least a half dozen times. I just didn’t want the book to end. Bryce, I thank you for a magnificent read!! I will keep Jessica, Mary and Rusty in my dreams a little while longer. I totally agree with your view of the book and I would like to add that the book goes on a crescendo up to the middle where the tale seems to be of Jessica, Jack, their love and the family intrigue. How would one explain that the finale is a court case about Aboriginal getting their kids back? It is definitely disappointing, considering the good level of the story up to the time Joe Bergman was alive. I live in a small town in South Africa without movie houses etc. When I get home from work, the only way to relax is to read a book. I have read many of Bryce Courtenay’s books and must say that although I have not finished the book I am really enjoying Jessica!! First of all, I have to say that I haven’t read the book but I watched the film/series. The film managed to encompass some negative points the first commentator made.I agree with the first commentator. Just finished reading Jessica and it’s 1am *Yawn* I found it inspiring and incredibly moving. A real page turner! I agree & disagree with the opening post. Clearly some bits needed editing, BC was beating around the bush at times…I won’t lie, I did skip a page or two. That said, it’s been ages since a book has kept me up this late. What a story! I just can’t get over the injustice. The ending is realistic and doesn’t feed the mainstream expectation of something happier. Pretty sure I’ll be dreaming of the Australian outback tonight, can’t get this story out of my head!!! I too loved this book. Granted the author of this post doesn’t enjoy Bryce Courteny and so be it, a review is simply one persons opinion to be taken with a grain of salt. Please read this book and form your own opinion as it is worth the read. I found Jessica to be a great read; well written with a wonderfull storytelling style. Courtney is, in my humble opinion, on of the best modern authors of our time. I would recommend just about anything that he has written. I HAVE READ THE BOOK, AND YES I THIS IS MY SECOND TIME I AM READING THIS BOOK. I ALSO HAVE THE DVD WHICH I WATCH EVERY YEAR. I HAVE ALWAYS LOVED THE STORY ABOUT A STRONG YOUNG WOMEN AND WHAT SHE WENT THROUGH IN HER EARLY LIFE. About one third into this novel and I must say that it is poorly written, over-written, and, so far at least, very difficult to believe. I agree that the dialogue is awkward and quite silly at times as it tries to capture what Bryce thinks was the vernacular of itinerant farm labourers in turn of the century Australia. It would have been extremely difficult for someone like Jessica to exist let alone thrive against the adversity of mysoginist rural Australia as she seems to in this novel. In this sense the author’s ambitions seem to belong to the 19th century Romantics, where the nobility of a poor and dispossesed ‘Tess’-like character seems to be the method whereby we are drawn to sympathise with her social and sexual plight and feel angry with the social and gender rules of society at that time. I think if you want to see this better done then you should read The Thorn Birds. I’m not a fan of this either, but the writing is better. I might be crying along with all the other positive reviewers here by the end of the novel but I think it will be more a sigh of relief. Just finished reading it a second time. Was prepared for the sad ending this time and didn’t require quite as many tissues. This is one of the few books that has my full attention right to the end, love the story, don’t love the injustice of it all. Agree with some that part of it, especially the court case was a bit tedious and also would have liked some sort of update as to what happened to the rest of family and whether Joey ever found out who is real mummy was, also what happened to Mary and her kids but nevertheless a brilliant read!! No it isn’t. In fact the mini series annoyed me so much, I refused to read the book.